Parking fines in Lancashire are charged at two levels - for higher and lower-rate offences. As Lancashire County Council reveals that traffic enforcement officers will be visiting all of its schools to prevent children being picked up or dropped off on zig-zag lines at the gates, we take a look at some weird, wonderful - and useful - facts about parking rules in the county. The authority is responsible for on-street parking regulations everywhere in the county, except the standalone council areas of Blackpool and Blackburn with Darwen. District councils regulate most of the county's off-street car parks. The rulebook governing parking regulations across the country runs to over 400 pages. READ MORE >>> Schools to get parking warden visits and other parking hotspots to be hit with "a flying squad"
***There are two levels of parking fine issued by Lancashire County Council. According to parking boss, Peter Bell, “as a general rule” if you park on a round-the-clock restriction, you will be fined the higher rate of £70. But if you stop somewhere that parking is permitted – but overstay your entitlement – you will be fined the lower rate of £50. Peter Bell, the Highways Regulation Enforcement Manager at Lancashire County Councillors, laying out the rules of parking on the road. ***Most of Lancashire’s parking restrictions (20 percent) are in Preston, followed closely by Lancaster. Ribble Valley has the fewest, with under 5 percent. ***The traditional link between roadside signs and yellow lines has been removed – councils can choose to display one or the other if it is “reasonable” to do so, Peter Bell said. ***It is no longer a legal requirement for yellow lines to have a T-bar ‘transverse’ mark at the point which they stop, after parking fines elsewhere in the country were successfully challenged because of a regulation which required it. The practice remains “advisable”, Peter Bell said. ***Obstruction of the highway is a criminal offence, which is enforceable only by the police. 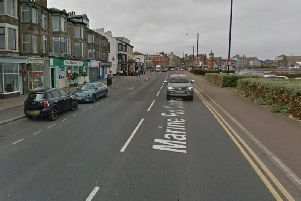 ***Cycle lanes marked out with a dashed line mean motorists are advised not to park in them - and parking may be banned altogether if there other, separate restrictions in force. But a solid line encasing the cycle line means drivers must not park there. ***On-street parking bays can be any colour a council chooses to paint them - but if they are marked out only by a line, the line itself must be white. ***If you started in Preston and painted the full length of yellow lines found in Lancashire down either side of the road – you would end up in London.